Well, I thought to myself; a very impressive start. The bar was already set to a lofty level before I’d even set foot inside. With due respect to my magical doorman, stepping inside the lobby was a different matter entirely. A stunning landscape of white marble and elaborate furnishings led through to a glorious atrium made of pale Jerusalem stone, so high, it looked, rather fittingly for Jerusalem I thought, like it was reaching toward heaven. 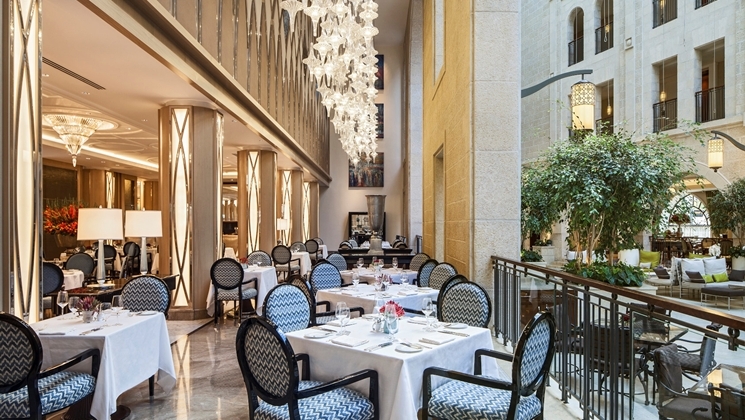 The hotel may be new, a six year labour of love from Israeli architect Yehuda Feigin and Turkish interior designer Sinan Kafadar, but its roots date back to 1929 when as The Palace, it was heralded as Jerusalem’s very first luxury hotel. Just a few minutes’ walk from the ancient walls of Jaffa Gate in the Old City, it was an iconic beginning. Sadly, this glorious birth was short lived as a hotel, but after years of decline, it’s purchase by the Reichmann family bought the grand old lady a new lease of life. 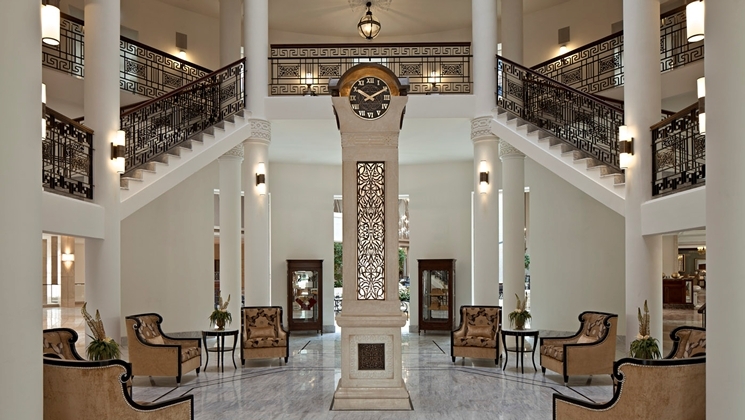 The ornate grandeur was fully restored, in particular the sweeping marble staircase, a more than suitable showcase for the iconic Waldorf Astoria clock, a replica from the 1895 Chicago original which is showcased in one form or another in every international Waldorf Astoria hotel. The considerable Reichmann investment also included a brand new wing alongside its heritage partner giving the hotel 197 guestrooms and 29 suites, one of which was mine of course. “And lastly, all the soft drinks in the mini bar are complimentary, as is the espresso machine and the bedside bottles of mineral water ” gasped a breathless Jason. Breathless because he had just completed a whirlwind tour of my spectacular King Suite, managing to describe every aspect of my room from the mirror-embedded bathroom TV to the controls of the in-room I-Pad in under 3 minutes. We sat for another minute to help Nathan get his breath back and to complete check in formalities, all very civilised and a perfect example of the Waldorf Astoria personal concierge service, then with a wave and a promise that my “chosen complimentary welcome drink was on its way” he was gone. I had to admit, in the sudden silence that prevailed, I missed Jason. Back downstairs the stunning Promenade Atrium was filling up. With its indoor trees, vaulted windows and archways it reminded me of a well to do Jerusalem street. Off to one side, the Palace Restaurant was where the legendary Israeli breakfast buffet took place; a feast of fresh dairy products and salads. 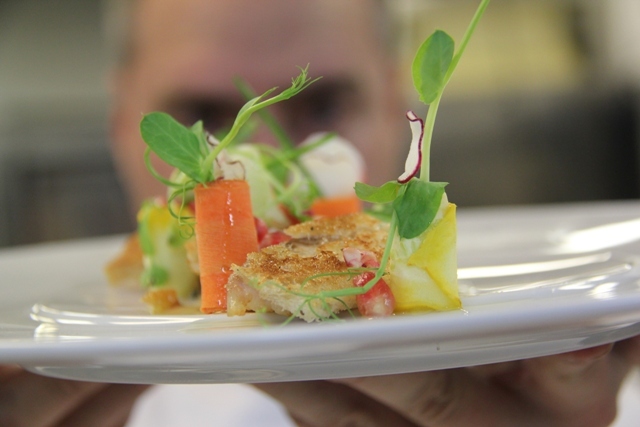 But now, after midday, it was transformed into a strictly kosher fine dining culinary experience; an a la carte menu and a seven course tasting menu, all masterminded by Executive Master Chef Itsik Barak. Talking of masterminding, it seemed I had arrived at a tense moment as Barak was about to present a new dish in collaboration with a young American chef Joseph JJ Johnson, a rising star of the US based James Beard Foundation and Head chef of two popular restaurants in Harlem. Together, they were part of a new global culinary initiative called Taste of Waldorf Astoria where Waldorf Astoria Executive Chefs from Amsterdam, New Orleans, Beijing, Jerusalem, and Orlando each battle it out with a young collaborator to create a new iconic Waldorf Astoria signature dish to rival Eggs Benedict and the Waldorf Salad. Barak is something of a gastronomic legend in Israel and Jerusalem in particular , the city of his birth. 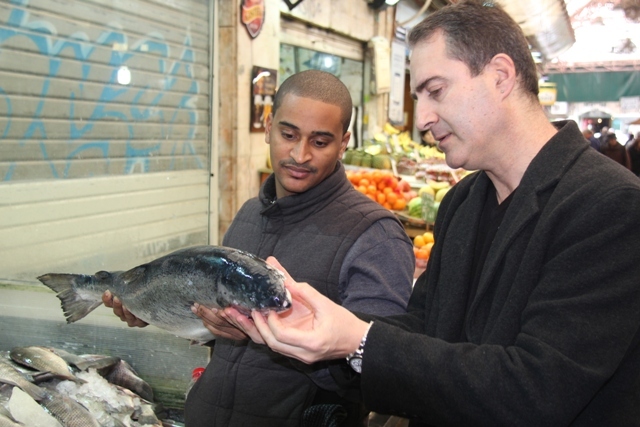 He was keen to utilise his first hand knowledge of the best traders in Jerusalem’s historic market place Mahane Yehuda, together with his flair for fresh Mediterranean inspired recipes, to build a winning dish showcasing the best of Israeli ingredients. 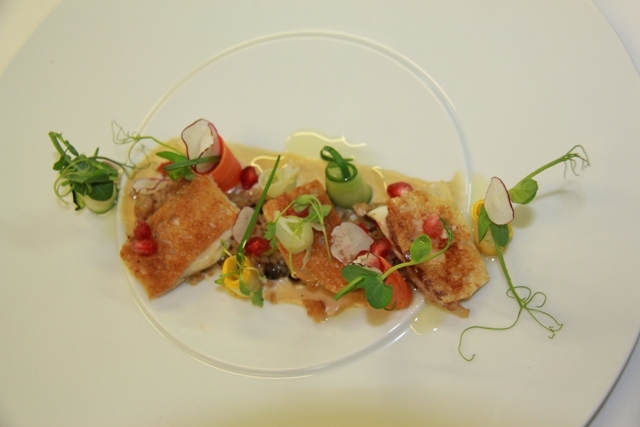 As Barak and Johnson’s entry, The 7 Species was unveiled, (Sea bream with eggplant, tahini and bulgur wheat) international media types and most of Israel’s best restaurateurs sat down for a lavish sample. The final of Taste of Waldorf Astoria is in February in New York, and by the looks of the empty plates all around me, we could have just eaten the winner. I spent the afternoon walking the Old City’s timeless streets, just a ten minute walk from the hotel, through the new pedestrian Mamilla Arcade to Jaffa Gate. The ancient streets never cease to amaze, the sights and smells of spices always an intoxicating combination. Once night fell, I was back into the welcoming arms of the Waldorf Astoria Jerusalem sampling a cake and a glass of wine at King’s Court, the all day kosher bistro which doubles as a cocktail bar in the evenings. The wine was excellent by the way, from Flam, a boutique kosher winery on the outskirts of Jerusalem who supplies Waldorf Astoria Jerusalem almost exclusively. 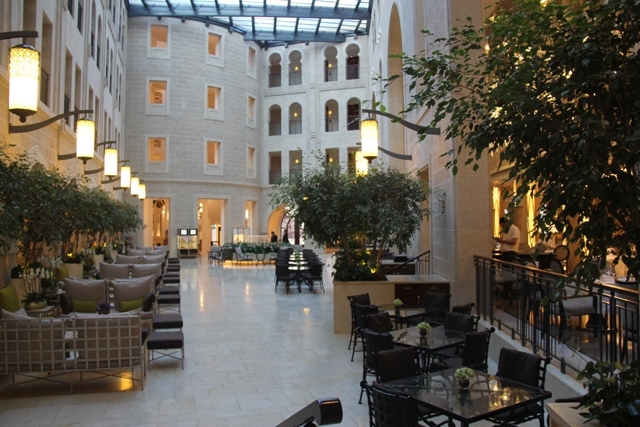 This is a very impressive hotel, a world apart from most Israeli luxury hotels who still haven’t quite mastered what 5 star is supposed to mean. 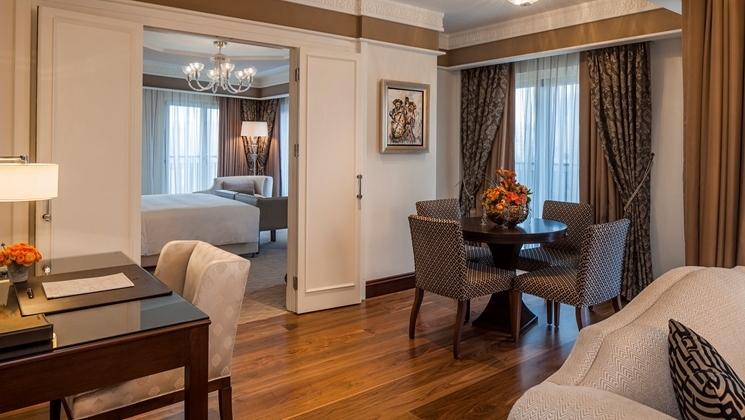 Everything here has a mark of quality to it, from the outstanding service levels and the jaw dropping art wherever you look, to the stunning guestrooms and Barak inspired restaurants. As I was reluctantly leaving, Jason waved me goodbye as he was ushering a new guest into the elevators for another breathless voyage of discovery no doubt. 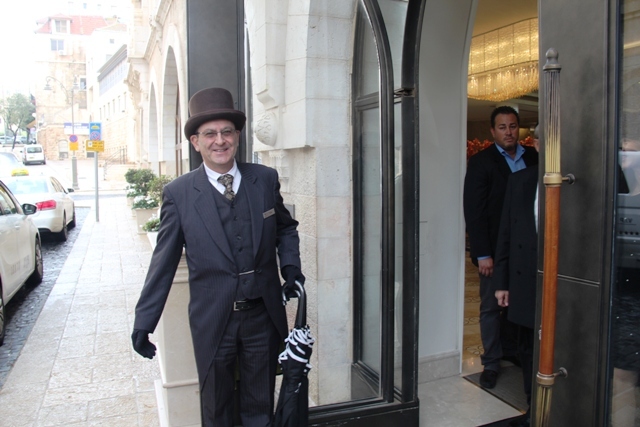 Meanwhile my doorman was back tipping his hat, minus the umbrella trick this time. 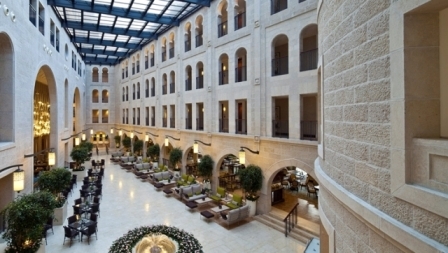 The hotel is just a few minutes walking distance to Jaffa Gate via the new pedestrian Mamilla Mall. 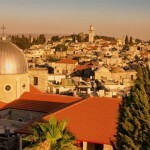 Room rates at Waldorf Astoria Jerusalem start from $405 per night on a bed and breakfast basis. British Airways flies three times a day to Tel Aviv. Prices start from £304 return, including all taxes and charges. 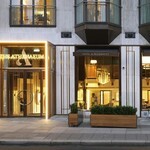 For reservations visit www.ba.com/telaviv or call 0344 493 0787. HolidayExtras.com offers a choice of airport parking, including Meet and Greet parking at most UK airports. Meet and Greet parking is the hassle free way to start a holiday – to book Heathrow Airport Meet & Greet from £72.99 for one week; visit www.holidayextras.co.uk or call 0800 1313 777.